12oz. bottle into a pint glass. A- Pours a dark ruby red color with a touch of brown hue resulting in a thin mocha color head. Active carbonation, not a spot of lacing. S- Smoke and minerals, ash. Not 'natural' enough. T- Dark malts, chocolate make up the body of flavor here, then smoked grain finishing taste. M- Light and mild. The smoke finishes a bit too metallic. O- Once past the nose, the results are drinkable. A- dark reddish black, non translucent, slight brownish off white head that dissipates very fast, slightly above average carbonation for a porter. S- smoked malts, chocolate, slightly sweet. T- smokey, slightly sweet, chocolatey. Slightly sweet smokey aftertaste. M- medium bodied, alcohol well hidden, well balanced, defintely drinkable. O- This was defintely my favorite of the 4 different beers from the Rock Art variety pack. Nice balanced smokiness mixes well with a light sweetness. In my opinion definitely an easy beer to drink. I tried a Growler from a local beverage mart... I love the Double Smoked Porter (part of their Xtreme offerings), so I thought the Midnight Madness smoked porter would follow along. I will say that I am disappointed. While the nose was there, nice smoky note, what followed was, er, weak, at best. The dark color belied the thin, spare mouth feel. This porter seems more like a porter mixed with a pale ale, rather than a stout mixed with a bitter, like a true Porter should be. 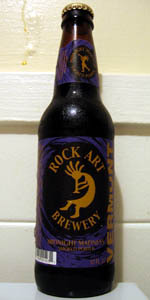 I have had most of the Rock Art offerings, and this is atypical of their other brews, which are really good.